I installed OBIEE11G in my machine and I tried to login to Preseatation Services ,got the bellow error .I am somehow able to bypass the issue and able to access the Presentation Services. Step1 : Navigate to “Control Panel\All Control Panel Items\Administrative Tools” and open the ‘Data Sources (ODBC)’ . Step2: You can find the Datasource name like ‘coreapplication_OHxxxxxxxxxxxxx’ . Double click to open that . 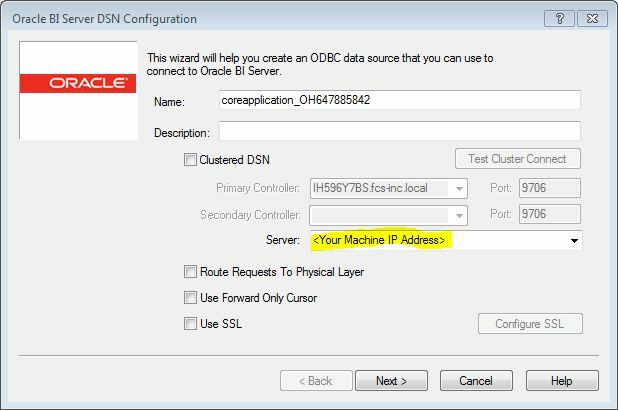 Step3:Uncheck Clustered DSN .In Server IP Address, mention your Computer Name. Then simply Click Next -> Next -> Finish. Step4 : Restart OPMN Services in cmd prompt using the below link and you should be able to login .